Christa loves Christmas, and has extensive plans covering everything from decorating to socializing. Even though her family is going to Europe for the holiday because her mother is touring in a play, she knows they can still have an awesome holiday. Right before they are to leave, however, Christa's parents sit her down and break some bad news to her-- they are getting a divorce, and her father will not be traveling with them. Christa is furious with both of them AND devastated that her Christmas plans are never going to be the same! She puts on her best mopey tween mood and takes off for Rome, Paris and London, where she is forced to hang out with the children of other performers and go around in a sightseeing tour with a guide. 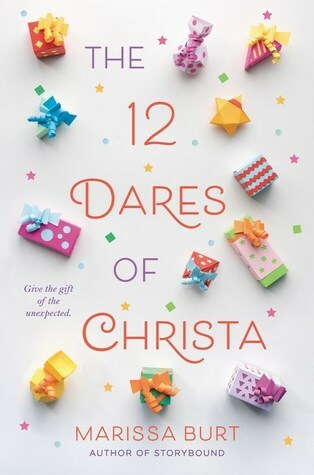 Her father has arranged for her to have 12 presents and attached dares sent to her, and she enlists the help of some of the other travelers to help her. She has to go outside of her comfort zone a bit (which is tough, especially since she is phobic about new food), and it doesn't help that her mother is apparently dating one of the actors! Even with all of the changes, can Christa manage to have a good holiday? Strengths: This is a fairly light-hearted tale involving travel to Europe, and it deals with the aftermath of divorce, so this should be appealing to many readers. A light touch of romance for Christa doesn't hurt, and the cover is very pretty. We could use more covers like this one, in fact! Weaknesses: The way the parents handled the divorce seemed odd, and I could have used a little more explanation about Christa's rather serious food issues. What I really think: I like my books about traveling to Europe to include a lot less whining, but I think my students will like this one. I do get occasional requests for books about Christmas. Violet's mother died of cancer a year and a half ago, and her father has just married one of the teachers in her school, Melanie aka The Hammer. Over Thanksgiving, Violet has to move out of her house and into another one with Melanie and her two children, Olivia and Joey. 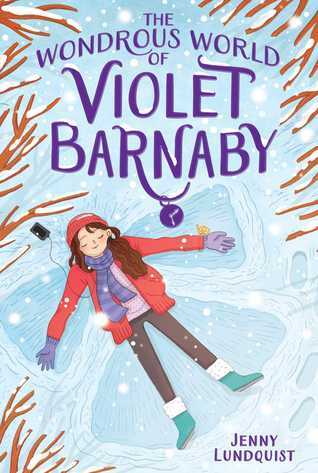 Melanie seems like the typical evil stepmother-- she won't let Violet paint her room, she has put all of the Barnaby's possessions in the garage, and she keeps "forgetting" that Violet is a vegetarian. Violet is having trouble getting along with her friends Izzy, Sophia and Daisy, who frequently complain about how unpleasant their mothers are. When she is assigned to work on a history project with her crush, Austin, she takes a lot of comfort in commiserating with him, since his mother may move to New York for a year to attend a cooking school. Violet continues to struggle with Melanie's rules and feels that her own interests are not taken as seriously as Olivia's, although she is glad that her father is no longer crying in his bedroom and not paying attention to her. There are some good times, and Violet is surrounded by people who want to support her. She has a counselor at school to talk to, and in the end, Melanie and her children really do want to make a new family that included Violet as well as her father. Strengths: There need to be more books like Love You Like a Sister that cover the extremely complicated process of merging families in a realistic but hopeful way. I loved the small town community and the close knit relationship between the girls and their families. Violet's processing of her mother's death is realistic, as is her budding relationship with Austin. I thought the use of text messages in this was done particularly well. Weaknesses: This comes right up to the line of "overly sad". What I really think: This could be read independently of The Charming World of Izzy Malone, but since I didn't purchase that title, I may pass on this one.